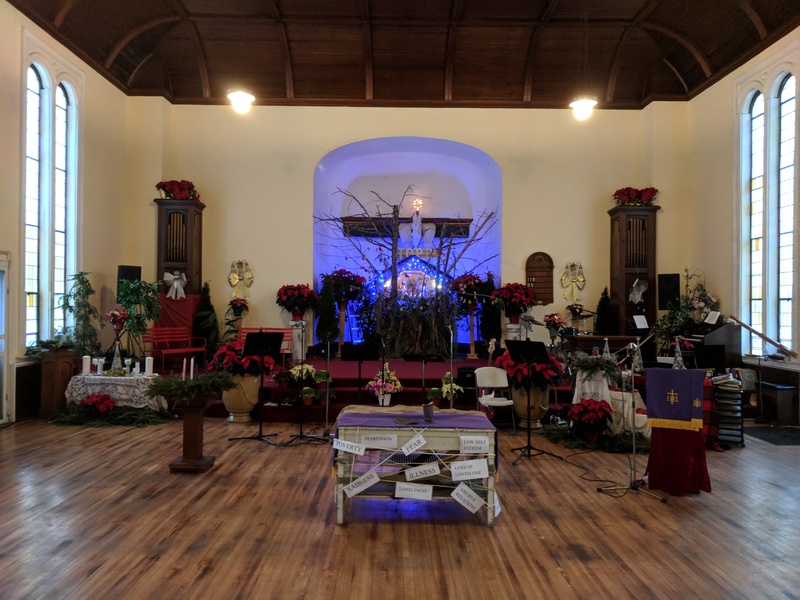 Our December installment of the Third Sunday Lord’s Table was held on December 17 during our service of worship. As it was also the third Sunday of the Advent Season the focus was on ‘Joy’ and tied together the idea that joy was intimately connected to the notion of freedom which was a central theme of the ministry of Jesus. Along with the Advent scriptures from Isaiah which spoke of setting the captives free the service centered on those things which keep many imprisoned from within. Issues such as fear, depression, loss of a loved one, a lack of family approval, chronic illness, and a lack of sufficient resources can all serve to keep many bound up and unable to find or experience the true joy offered to us by our Lord. The table was a simple wooden table which was wrapped tightly with various cords and ropes and then decorated with small signs listing those issues that keep so many in our community in a state of virtual captivity especially at this time of year when loneliness and difficult situations are brought into much sharper focus. For more insight refer to the December 17th post of ‘The Pastor’s Pen’.